Each Thing can contain multiple Thing Parts, which in turn contain multiple States/ Cells (see glossary). For instance, if you had a bottle which when shaken should turn from blue to green, you could context-laser its body, and use "When shaken then become next in 1s", and for the second state, color it green. 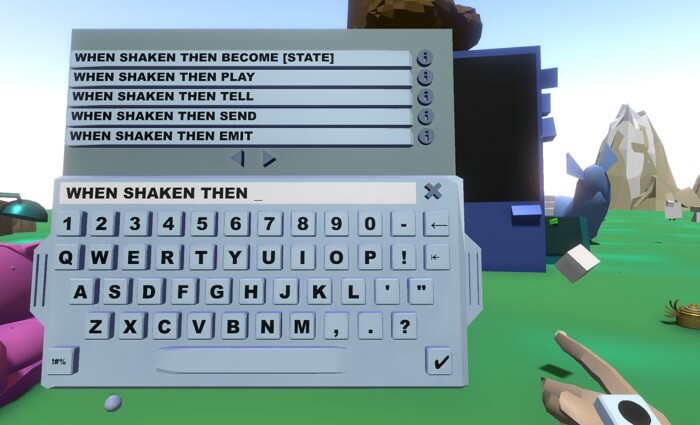 With this simple structure, and combined with messaging commands across Things, you can do just about anything you can imagine! Scripts are always using auto-completion guidance, and you can click the info "i" next to each command from within Anyland to find out more. Above video gives a general overview of scripting (if you jump to the start of the video, you'll get the general introduction to Anyland), and this page references all available commands. To simplify, you can also always write "become next" instead of naming the cell number. It will then go to the next used cell, or back to the first cell if it hit the end of your used cells. As opposed to some other events like "When touched", the "When starts" event is not always perfectly synchronized, as it triggers for different people at different times when they enter an area. It will however still be in-sync if something else (e.g. "when touched" from a previous cell) preceded its animation. Generally, when you switch states, they'll auto-reverse after 30 seconds. If you want to have a Thing receive touches, but not normally collide, you can select its "..." → "..." → "Can pass through" setting (and make it invisible). You can also have the other object's parts, in specific states, have distinct names. For instance, you could have a torch whose main body is sometimes called "flame". Use the "call me" command for that. A Thing Part is considered triggered when it is part of a Thing that's currently held, and one presses the trigger button on the controller (see the controls setup). Ensure that the Thing is a Holdable with "Remains Held" ticked for this to work. If you currently move a leg with that hand/ controller, the triggering will go towards that attached leg Thing instead of the holdable. To do something when the trigger action ends, use "When trigger let go" (which also covers leg movement trigger-stopping). Alternatively, if you want a non-held object to react on press, see "When grabbed". Also see "When walked into". "Pressed" can be any other string of your choosing (including multiple words, like "red button pressed"). ... then tell [word] When told [word] ... Sends messages within that Thing only. ... then tell any [word] When told by any [word] ... Sends messages across whole area. ... then tell nearby [word] When told by nearby [word] ... By parts within 7.5m to the receiving Thing's center. When told by body [word] ... ... then tell body [word] Sends a message from body parts to other parts of this body, and holdables. ... then tell first of any [word] When told by any [word] ... Sends a message to the closest reacting other thing. ... then tell in front [word] When told by any [word] ... Sends a message to all thing parts in front, at any distance. (Parts need to be collidable and may not use "Can pass through". Parts are messaged in order from nearest to furthest.) Turn on "..." → "Show direction" to visualize the forward direction. ... then tell first in front [word] When told by any [word] ... Same as "tell in front", but stops after the first Thing Part ahead it hits (whether or not that part listens for the event). When using "Tell Any", you may want to ensure the tell word is sufficiently unique, as otherwise e.g. a visitor to your area may accidentally trigger it with a holdable or so. You can also use the Twitch Chat settings to connect to a live Twitch stream chat, where every chat line people type which is preceded by a "!" will turn that string into a tell to receive via "When told by any". ... inventory opened left then ... When the left hand opens the backpack. ... inventory opened right then ... When the right hand opens the backpack. ... inventory closed left then ... When the left hand lets go of the backpack again. ... inventory opened left then ... When the right hand lets go of the backpack again. ... hand touches left then ... When the left hand touches something. ... hand touches right then ... When the right hand touches something. ... ping received ... When a friend pings you from another area. ... ping received from [person name]... When a friend by that specific name pings you. ... ping sent ... When you ping someone else. ... someone was born ... When someone launches Anyland for the very first time, and their birthday alert is sent around the area to random loyals. ... someone arrived in area ... When someone newly enters the area. ... hand triggered left then ... When someone starts holding the trigger on their left hand (also see "When triggered"). ... hand triggered right then ... When someone starts holding the trigger on their right hand. ... hand trigger let go left then ... When someone stops holding the trigger on their left hand. ... hand trigger let go right then ... When someone stops holding the trigger on their right hand. ... both hands triggered then ... When holding the trigger on both hands. This gets sent before the individual "left/ right triggered" body tell (for the second hand that starts the press). ... dialog [optional name] opened left then ... When no dialog (a hand menu) was open and any dialog is opened at the left hand now. See dialog names. ... dialog [optional name] opened right then ... When no dialog (a hand menu) was open and any dialog is opened at the right hand now. See dialog names. ... dialog [optional name] closed left then ... When a dialog on the left hand is closed and no dialog is open anymore. See dialog names. ... jumping ... When someone jumps in desktop/ keyboard mode. ... hand touches hand ... When your hand touches someone else's hand, like for a high-five or handshake. ... left hand touches hand ... When your left hand touches someone else's (left or right) hand. ... right hand touches hand ... When your right hand touches someone else's (left or right) hand. ... consumed ... When you eat something, that is, your mouth touches something which triggers "when consumed". ... leg triggered left then ... When someone starts holding the trigger on their left hand/ controller while moving their left leg (also see "When triggered"). ... leg triggered right then ... When someone starts holding the trigger on their right hand/ controller while moving their right leg. ... leg trigger let go right then ... When stopping to hold the right trigger while leg moving. ... context laser started left ... When one starts pressing the left hand context laser. ... context laser started right ... When one starts pressing the right hand context laser. ... context laser ended left ... When one stops pressing the left hand context laser. ... context laser ended right ... When one stops pressing the right hand context laser. It triggers exactly the same, but may be preferable if the action is not meant to be about eating or drinking. Some edible creations (like so-called Tele-Cookies or Tele-Oranges) are using the "microphone" attribute. This will cause the voice to be heard all across the area after eating the object. (It will also pop up a dialog reading "Everyone here hears you now (you can disable that via Me dialog, or switching areas).") Note amplified speech can be disabled via "... then disallow amplified speech". Also see "When neared", which triggers right after "When walked". The maximum distance for this to work from finger tip to Thing part is 10 meters, and this event is checked every 0.5 seconds. Also see "When looked at". The maximum distance for this to work from head to Thing part is 10 meters. This event is checked every 0.5 seconds. Also see "When talked to". This event triggers when a statically placed Thing's Part is touched and the trigger is pressed. For instance, you could use this for a door knob, which using a tell to the door hinge then opens the door Sub-Thing. This triggers when a Holdable is wildly shaken when held. For instance, you could create a soda can that bursts open when shaken, or create a magic wand that results in particle effects upon heavy waving. This event fires for any Thing Part of a head attachment when that person speaks into their microphone. This is useful for e.g. creating mouth animations, as you only want the lips to move when one speaks. This happens to the object if one looks at it, then speaks something. For instance, you could have a being in the world (NPC) react to people trying to talk to it. As with the "Looked at" event, this is checked every 0.5 seconds, at a distance of up to 10 meters. This happens when a Holdable is turned upside down, e.g. someone wants to empty a bottle. This triggers whenever a Holdable is held and moved at a high speed. This triggers when a Holdable or Movable is dropped again. This triggers when a Holdable is raised up in the air. Specifically, it looks for the hand's upwards velocity crossing a certain threshold. This triggers when a Holdable is lowered. Specifically, it looks for the hand's downwards velocity crossing a certain threshold. When this part is hit by something at high speeds. A normal "When touched" is always triggered after this event, too. A normal "When touches [thing name]" is always triggered after this event, too. See the "Call me" command to change a hitter part's name. When a person gets in the vicinity of 7.5 meters of this part, measured from the person's torso center to the Part's parent Thing center. Also see "When someone new in vicinity". When a person gets in the vicinity of 7.5 meters of this part for the first time during that area visit. The distance is measured from the person's torso center to the Part's parent Thing center. This command is useful to trigger something only once. Also see "When someone in vicinity". When something stops touching. E.g. a hand just ended its tap of a table surface, or an object stops colliding with another object. To catch the start of a touch, see "When touches". This event fires for a held object when the trigger is let go again. Make the Holdable of the "Remains Held" type if you want to use this command. For the trigger start even, see "When triggered". When a Thing and its Parts end their lifetime, like a thrown mug shattering on impact. Using the "any part" prefix for events, like "When any part touches...", will apply the command and its results equally across all parts of the Thing (including its Sub-Things). This can save you from having to script the same command for many Parts of a Thing. Also see "When any state". Using the "any state" prefix for events, like "When any state touches...", will apply the command and its results equally across all states of this current Thing Part. This can save you from having to script the same command for many States of the same Part. Also see "When any part". This allows your objects to listen to speech commands, or conversation starts. For instance, a computer terminal could react to the word "restart", or an NPC to the word "Hello". When the object is placed, this command works at a radius of 7.5 meters from a person's head towards the center of the Part's parent Thing. When the object is attached, it triggers when oneself is speaking. This command relies on Windows speech recognition to work in Anyland. It is (unfortunately) a known issue that it won't trigger on some systems. ... microphone Whether the microphone is active. ... see invisible Whether one can see invisible as editor. ... touch uncollidable Whether one can touch uncollidables as editor. ... lower graphics quality Whether graphics quality is lowered to improve performance. ... fly Whether one can fly as editor. ... findable Whether one's current area is shown in the friends list. ... stop alerts Whether during creation, angles snap. ... snap angles Whether during creation, angles snap. ... soft snap angles Whether during creation, angles soft snap. ... snap position Whether during creation, positions snap along an axis. ... scale all parts Whether during creation, all parts scale uniformly together. ... scale each part uniformly Whether during creation, each individual part scales uniformly. ... finetune position Whether during creation, movements are finer. ... symmetry sideways Whether sideways-symmetric parts should be added. ... symmetry vertical Whether vertically-symmetric parts should be added. ... symmetry depth Whether depth-symmetric parts should be added. ... show grid Whether a grid is shown in the area for more precise building. ... snap things to grid Whether placements snap to the grid for more precise building. ... snap thing angles Whether generally, placement angles snap (overriding thing settings). ... snap thing position If generally, placements move on an axis (overriding thing settings). ... ignore thing snapping Whether generally, placement thing snappings will be ignored. ... extra effects in vr Toggles extra effects in VR (may lag; needs one to be over 1 day old). ... lock angles Whether to fully have rotation locked for editing. ... lock position Whether to fully have position locked for editing. When text was typed. Can be attached and used with the "then say [typed]" command. When a scripting variable value changes, including when that value is initiated during area load. Use e.g. "When is somevalue >= 2 then ...". You can also combine this with other events, e.g. "When touched and is somevalue >= 2 then...". somevalue >= 2 When the value named "somevalue" of this thing is equal or over 2. "Somevalue" can be any name you choose. somevalue = 2 When the value named "somevalue" of this thing is equal or over 2. "=" and "==" both mean equal. somevalue == 2 When the value named "somevalue" of this thing is equal or over 2. "=" and "==" both mean equal. area.somevalue == 2 When the area value named "area.somevalue" reaches 2.
somestate When value "somestate" is true/ not 0 (you can also use "not somestate"). "Somestate" can be an name you choose. value >= 2 and state When all of these are true. value >= 2 and not state Use "not" to check for a value being untrue. value >= 2 or state When any of these is true. value != 2 A check for unequal (the same as "<>"). value <> 2 A check for unequal (the same as "!="). value < 2 A check for "lower than". value > 2 A check for "larger than". ... then the cube would smoothly transition from green to blue (and small to big) and back in an endless loop in the rythm of 1 second. become next in 1s Flips to the next state in 1 second. If the end of used cells are reached, it goes back to the first again, so you can always safely use "next". Note the "s" at the end of the number is always optional. become next in 5.5 Use floating point digits, like 5.5 seconds. We decided to omit the optional "s" from the number here. Note the default max state length is 30 seconds (unless you're currently editing the part and have its menu open, then it will remain). You can however tick a Part's "..." → "Persist States" option to have its state not revert (until everyone leaft the area). become previous in 1s Goes to the previous cell (or the last used one, if the current cell is already 1). become 2 in 1s Flips to the state of the provided number, like 2.
become untweened next in 1s Avoids any transitioning animation. For instance, if you go from a small cube in cell 1 to a big cube in cell 2, it would not show all the intermediate sizes, but instantly jump from small to big at the provided time (like 1 second, in this case). become unsoftened next in 1s By default, all transition animations are softened at the beginning ("Ease-In tweening") and end ("Ease-Out tweening"). By using the "unsoftened" keyword, you make the animation steady instead, avoiding all easing. Outside of scripting, you can also use the setting "Unsoftened animations". become soft start next in 1s This avoids just the Ease-In for the animation tweening. become soft end next in 1s This avoids just the Ease-Out for the animation tweening. become 3 via 2 The "via" command uses another intermediate state to animate with, for curvier movement. For instance, maybe you want a robot to float across the area from point A to B (cell 1 to 3), but you want it to make a bit of a curve (the curve being defined by the position of cell 2). This keyword is combinable with other options for the "become" command, but needs to be written last. become current in 1s Goes again to the current state, restarting it at the provided time. This can be used along with the "When any state" command. Plays a sound of the given name, e.g. 50% Plays the sound at a given volume percentage. Appending the word "volume" is optional. You can use any number from 1-500, and can include floating point numbers like 100.5%. The "%" symbol can be omitted if you want. very-low-pitch Plays the sound at a very low pitch (of 0.5). low-pitch Plays the sound at a low pitch (of 0.75). high-pitch Plays the sound at a high pitch (of 1.5). varied-pitch Plays the sound at a slightly varying pitch (the maximum variance is 0.1). very-varied-pitch Plays the sound at a strongly varying pitch (the maximum variance is 0.3). echo Plays the sound with an echo effect. low-pass Filters the sound to only allow low frequencies. high-pass Filters the sound to only allow high frequencies. reversal Plays the audio backwards. You can combine this with other options, but it will ignore pitch settings. 5 repeats Repeats the sound that many times (up to 50). You can use either the word "repeat" or "repeats". "1 repeat" means the sound will be played twice altogether. surround This will have the sound play at its normal volume at any distance across the area. Also see the Thing's "..." → "Surround Sound" setting. As distant objects are sometimes not showing (for optimization reasons), you may additionally want to use the Thing's "Show if far away too" setting. → A full list of sounds is available. Thanks to all Creative Commons & more sound makers! → See the full When Told/ Then Tell reference for more. Note for this command to work, it needs to be called from a placed object in the area, or an attachment to the body. send nearby to [area name] Sends all people nearby to the area of a given name, e.g. "When touched then send nearby to buildtown". Nearby here means a distance of up to 2 meters from a person's head to the closest point on the surface of the Thing Part. send nearby to [area name] onto [thing name] Applying both "send nearby to" (to transport to an area) and "onto" (to transport onto a marker, see "send nearby onto" above). send one nearby to [area name] Similar to "send nearby to", but will only trigger for the closest person, or the person who performed the relevant action, e.g. pressed the button that caused this command. send one nearby onto [thing name] Similar to "send nearby onto", but will only trigger for the closest person, or the person who performed the relevant action, e.g. pressed the button that caused this command. send all to [area name] Transports everyone in the area to another area, e.g. "When touched then send all to buildtown". send all onto [thing name] Like "send nearby onto", but transports everyone in the area to that marker. send nearby onto [thing name] at 45 degrees Add a degrees value from -360 to 360 in steps of 45 to specify the rotation the person should get after being transported. Please note this is currently in addition to the rotation a VR user may have within their room setup, so it may unfortunately at the moment not always end up facing as wanted. send [one] nearby to previous Transports one back to the previously visited area (while skipping "via" transit areas). send [one] nearby to current Transports one to the current area, useful e.g. when combined with "via". send [one] to [closest held] Transports one to an area by the name of the closest held thing, if any. This can be used with e.g. dynamic travel ticket systems. The value for [closest held] is a placeholder which is dynamically replaced when holding the object. Note you don't type the word "bullet"; instead, once you selected the "emit" command, you can drag & drop an item from your inventory. This will then auto-fill its name (and possibly add a number, like "bullet 2", if there's more than one object of that name being used in the Thing already). You can visualize the direction of a part by choosing the Thing's "..." → "Show center + direction" setting. One Base Shape especially helpful to understand forward (and upward & sideways) directions is the one pictured, for which you can also use the "Invisible (when done)" (and "Uncollidable") setting. The placements distance optimizer will always ensure Surround Sound things are active. To stop the loop again, use "end loop". Note there's also global area environment/ weather settings, some coming with their own background sounds. Open the Area dialog (the mountain & sun icon) to set them. As opposed to such environment sounds, the loop command sounds will have the 3d audio source be from the Thing Part itself, the volume shrinking as one gets further away. This command ends this Part's currently playing loop sound again. Once done, other objects could then use "When touches blade then ..." to check for blade collisions specifically (ignoring mere grip touches from this sword). Provides a haptic buzz feedback for the VR controller. This can be used by arm attachments or currently held Holdables. In non-VR desktop/ keyboard mode, this results in a sound effect. People can optionally disable any haptic pulse via the Me → "..." → More → "Lock Features" settings. This command drops this item if it's a currently held Holdable. You can optionally use "stop all parts" to stop it again. face someone Rotates the whole Thing towards the head of the closest person. face someone else Rotates the whole thing towards the head of the second-closest person. face up Rotates the whole thing upwards. To best understand forward, sideways and upwards directions of a part, you can use the specific base shape pictured. face empty hand Rotates towards the closest empty hand. face empty hand while held Rotates towards the closest empty hand while being held. Undoes something you started with "then all parts", e.g. "When shaken then stop all parts face someone". face someone Stops rotating towards closest or second-closest person. face empty hand Stops rotating towards the empty hand. face up Stops rotating the whole thing upwards. face nearest Stops rotating towards the closest thing of a name. face view Stops rotating towards the view of the eyes/ default camera. You can destroy the whole parent Thing of this part by using e.g. burst Destroys the thing by breaking it into parts. [burst] 10 force Applies a burst force from 0-1000. [burst] gravity-free Applies zero-gravity to the burst effect. 30s restore For placements, restores the thing after the given amount of seconds (from 0.01 - 86400.0 seconds; adding an "s" to the number is optional). [burst] 50 parts Sets the maximum number of parts to break into, from 1 - 250 (the default is 30). 5 grow Breaks into growing parts at a given speed from 0.01 to 100.0. 5 shrink Breaks into shrinking parts at a given speed from 0.01 to 100.0. 10s disappear The seconds after which burst parts start to disappear, from 0.1 to 60.0 (the default is 12.5). bouncy Makes burst parts bounce on collisions. slidy Makes burst parts slide on collisions. uncollidable Makes the burst parts pass through objects. self-uncollidable Makes the burst parts pass through each other. radius The destruction radius for the "destroy nearby" variant. Default is 2 meters. max-size The size limit at which things still get destroyed. Default is 0.2 meters. Use "... then reset area" to undo all deletions in the area again. All current rights are shown at the back of the Area dialog (click on your ring menu, then the mountain & sun button, to open that dialog). board [board name] Shows an Anyland in-world forum main page of that board's name, e.g. "When touched then show hangout". (You can optionally create your own custom boards, including area guestbooks or mailboxes.) This command requires placement or attachment, and one's action (e.g. touch), to trigger. thread [link] Opens a forum/ board thread for that link. You can copy the link from the backside of thread dialogs. This command requires placement or attachment, and one's action (e.g. touch), to trigger. video controls Shows the controls dialog for the closest nearby video screen. camera controls Shows the controls dialog for the closest nearby camera. slideshow controls Shows the controls dialog for the closest nearby slideshow screen. video [url] Plays the YouTube URL pasted (you can also copy it from the video controls dialog backside). Optionally add e.g. "with 0.15%" to adjust the volume. Note for Gifs, you can use the optimized enlarger URL like http://anyland.com/gif/?url=example.com/some.gif (paste your link into the Browser dialog to have it be auto-converted, ready for copying). You may use the additional parameters "width", "height", and "top" to set pixels, and "link" to define a URL for when the image is clicked. web [url] with navigation-free Like the normal "show web [url]" command, but disallows editing the URL, paging back & forward, or switching to videos. web [url] with cursor-free Like the normal "show web [url]" command, but hides the cursor and removes the ability to click into the browser. web [url] with unsynced Like the normal "show web [url]" command, but won't synchronize URL changes between people around. For instance, if the screen starts with "example.com", and one person clicks on a link on it that changes it to "example.com/foobar" for them, then another person around will still see "example.com". chat keyboard Lets you enter a text chat line. line Shows a line from the thing's center to this part. line with 0.1 width Like "show line", but setting a line width from 0 to 10 (the default is 0.01). line with 0.1 start-width Like "show line", but setting a start point line width. line with 0.1 end-width Like "show line", but setting an end point line width. line with 0 width Setting any width to 0 removes the line again. name tags Shows people's bottom name tags again for 30 seconds. name tags 100s Shows people's bottom name tags again for that many seconds (for up to 86400 seconds). areas [search] Opens an area search results dialog for your provided keywords. This command requires placement or attachment, and one's action (e.g. touch), to trigger. inventory Opens one's inventory. This command requires placement or attachment, and one's action (e.g. touch), to trigger. move 0.0 0.0 0.0 Moves a part's x y z coordinates relative to the world. move [local/ random] 0.0 0.0 0.0 Moves a part's x-y-z coordinates. Add "local" to move relative to itself instead of the world, and/ or "random" to move randomly by that amount. rotate [local/ random] 0.0 0.0 0.0 Rotates a part's x-y-z coordinates relative to the world. Add "local" to rotate relative to itself instead of the world, and/ or "random" to rotate randomly by that amount. scale local [random] 0.0 0.0 0.0 Scales a part's x-y-z coordinates relative to itself. Add "random" to scale randomly by that amount. color [random] 0 0 0 Adjusts the red, green and blue values from 0-255. Add "random" to randomize the color. saturation 0.0 Adjusts the color saturation from 0.0 - 1.0.
hue [random] 0.0 Adjusts the color hue from 0.0 - 1.0. Add "random" to adjust the hue randomly. lightness 0.0 Adjusts the color lightness from 0.0 - 1.0.
duplicate [local/ random] 0.0 0.0 0.0 Copies & moves to the x-y-z coordinates relative to the world. Add "local" to move relative to itself instead of the world, and/ or "random" to move randomly by that amount. material [material name] Sets to the material of the given name, e.g. "very metallic" or "transparent glossy". The names follow the format as listed in the Thing Format reference. become 1 Sets to a given state/ cell number (if that state exists). become stopped 1 Sets to a given state/ cell number (if that state exists), but won't trigger that state's "When starts" event. insert state Inserts a new cell after the current one. undo Reverts the last action, if any. If you use this command on an object that you then place into the inventory, it allows you to create a custom backpack paging interface. When touched then type "When consumed then become next in 5s"
When starts then 0 -20.5 0. The rotation only starts once the object is saved, it will remain static while you're still editing. For this command it can help to tick "Show center + direction" in the Thing's "..." option. The normal angle snapping (when set from the backside of the Create dialog) is 90, the soft angle snapping is 22.5. Note your custom value will reset upon changing to another area. While "default" mirrors a VR rendering straight to the desktop, "optimized view" does some optimizations that provide a better view, more closely resembling what you in VR would see. It can be a good setting if you want to stream for others or make a recording. It does take a separate rendering, though, so may not be as fast as the "default" view. "Default" follows directly, without any smoothing, so there may be some shaking when using this in desktop recordings or streams (but it also won't require a different camera render, so it can be very fast). The "none" option makes the desktop view camera remain statically at whereever it was when you picked the setting, it won't follow at all. This makes one (the person who interacted to trigger this command) the synchronization authority. This command needs a placement or editor attachment. Use e.g. By default, the sync authority is always automatically handled. It will be whoever is in the area longest, switching around as people come and go. With this command you can specify who in particular is the authority; for instance, maybe you have a pinball game where the ball is using the "Stricter physics syncing" option. For smoothest physics visuals for the current pinball player, you may then set them to be authority. This handles the achieving of Quests. Quests are mini-adventures or challenges where something at the end can be achieved, and achieving it is noted in forum threads. For instance, maybe you want to hand out a sceptre at the end of a dungeon, and everyone winning it will be noted in your dungeon's forum. ... where "king sceptre" is the name of the quest, as defined in the forum thread. For some example quests, have a look at the Anyland in-world "Quests" board. If you don't want people to carry holdables which attract or repel just about any thrown & emitted object in your area, you can disallow the "untargeted attract and repel" right. Please note these commands currently have no effect on VR mode movement. Intensity can go from 0 - 100 (the default is 12.5). Range can go from 0 - 10000. Cone size goes from 0 - 170. The available voices are either "male" or "female". Pitch and Speed values are relative, so "10 pitch" would mean +10. Percentages provided refer to the volume, so 50% means "half as loud as normal" (you can use from 0 - 200%, 100% being the default). Speech output considers the Thing's "Surround Sound" setting. Numbers range from -1000 to 1000. You can use either a single number, or 3 ones in succession to mean x-y-z. The actual head needs to be dropped from your backpack when you prepare this command. If the Thing's "..." options have "Add current body" ticked for it (or "..." → More → "Add current body, non-clearing"), it will later when worn also attach the currently worn body. Note this command triggers an Approve/ Undo dialog that automatically opens the mirror for the person whose appearance is changed. Heads prepared with auto-attaching bodies can also be simply touched in the Inventory to be worn. A head using "Add current body", where the head is also a direct edit-clone of the head worn while creating it, will in addition adjust its position and rotation appropriately as per the currently worn head. Percentages may range from 1 to 2500 (note the "%" sign is optional to use). The minimum change to the default size needs to be 10% for this command to take effect. Note only objects with video surfaces will be considered for streaming onto. Placeholders are supported in your speech text. To adjust the type of speaking voice, use the "set voice" command. The "project" command moves the respective part onto the next surface ahead. For instance, you could build a red dot laser pointer, or have legs reach the ground. Use e.g. The "reset" commands handles resetting of a variety of things. → This is the full list of available settings with more explanations. The "turn" command is used to turn a Thing, Thing Part or Sub-Thing on and off, or to just toggle its visibility or collidability. The Me dialog's "..." settings "See invisible (as editor)" and "Touch uncollidable (as editor)" can override these behaviors. A thing is also enforced to be collidable when shown in the Inventory, so that one can always grab it. You can then check again for these values using "when is". Note whenever you change a variable value, it will automatically look again in the area for "when is" checks that relate to that variable, triggering them again when qualifying. All numbers are set to 0 at start. Up to 50 per tick are calculated. somevalue = 10 * (othervalue + 0.5) Sets thing value "somevalue" (this persists until everyone leaves). area.somevalue = 10.5 A math expression to set area number "somevalue" (this persists until everyone leaves). somestate Sets "somestate" (can be any other name you choose) to be true (which equals 1). not somestate Sets "somestate" (can be any other name you choose) to be false (which equals 0). person.somevalue = 2 Sets the value for a person (who has this attached or is closest) in the context of that specific area, e.g. person.gold = 5. Person values are persisting (unless e.g. Anyland is installed on a different computer) and they are guarded to not be read or set by other areas. This means if you set person.gold = 5 in Area A, it won't affect that person's gold in Area B.
somevalue = random(min max) Get a random number between the first and second parameters (inclusive). "Somevalue" is just an example variable name and can be anything. somevalue = randomfloat(min max) Get a random floating point number between first and second parameters (inclusive). somevalue = absolute(value) Gets the positive number, e.g. -17.5 turns into 17.5.
somevalue = round(value) Rounds a value to the nearest integer in mathematical fashion, e.g. 5.5 turns into 6.
somevalue = floor(value) Rounds the value down, e.g. 5.8 turns into 5.
somevalue = ceil(value) Rounds the value up, e.g. 5.2 turns into 6.
somevalue = smaller(a b) Gets the smaller of the two number parameters. E.g. smaller(15 10) would return 10.
somevalue = larger(a b) Gets the larger of the two number parameters. E.g. larger(15 10) would return 15.
somevalue = sqrt(value) Returns the square root. somevalue = exp(value) Returns Euler's number e raised to the specified power. somevalue = sin(value) Returns the sine of the specified angle. somevalue = cos(value) Returns the cosine of the specified angle. somevalue = tan(value) Returns the tangent of the specified angle. somevalue = log(value) Returns the natural base e logarithm of a number. somevalue = mod(number divider) Returns the remainder of number divided by divider (a modulo operation). somevalue += [millisecond] - [x] Uses available placeholder values if they return numbers. somevalue += 2 Increases the number named "somevalue" by 2.
somevalue -= 2 Decreases the number named "somevalue" by 2.
somevalue *= 2 Multiplies the number named "somevalue" by 2.
somevalue /= 2 Divides the value by 2. Division by 0 is ignored. somevalue++ Increases the number named "somevalue" by 1.
somevalue-- Decreases the number named "somevalue" by 1. The following placeholders can be used in some commands, like for speech output using "say", tell data, and (excluding placeholders returning a string) variables handling. The current year, like "2019". The current month, like "03" for March. The current month but without a leading zero, like "3" for March. The current date's day number, like "09". The current date's day number but without a leading zero, like "9". The current Anyland time's hour on the 24 hours clock. The current Anyland time's hour on the 12 hours clock. The current Anyland time's hour on the 24 hours clock, without a leading zero. The current Anyland time's hour on the 12 hours clock, without a leading zero. Same as [hour], but for one's local time zone's time. Same as [hour 12], but for one's local time zone's time. Same as [hour unpadded], but for one's local time zone's time. Same as [hour 12 unpadded], but for one's local time zone's time. The name of the person who has this body part/ wearable or sticky attached. The name of the person closest to the object using this placeholder. The name of the Thing using this placeholder. The name of the closest currently held Thing, if any. An alphabetically sorted list of all the people currently in the area. The number of people currently in the area. The name of the current area. The area position x coordinate of this thing. The area position y coordinate of this thing. The area position z coordinate of this thing. Lists all this thing's current variable values (0's may be omitted). Lists all area. * variables (0's may be omitted). This placeholder needs placement or editor rights to show its values. Lists all person. * variables of the closest person. This placeholder needs placement or editor rights to show its values. Lists everyone's person. * variables of this name. This placeholder needs placement or editor rights to show its values. The value of a variable by this name, e.g. [gold value] or [area.lumber value]. The distance in meters to the next thing ahead. For instance, you could make a measuring machine which tells you how far away an object pointed at is. An object that can be picked up (even by non-editors of the area, always creating a temporary clone in the hands). Use "..." → "Holdable" (and optionally, "Remains Held") for the Thing to set this. Some commands, like "When triggered" or "When shaken", require the object to be a held Holdable. Useful for e.g. board games or playing cards, these objects can be moved in the area. Use the Thing's "..." → "Movable" to set this. Movables reset to their original position once everyone left the area. The whole created object and all of its parts. 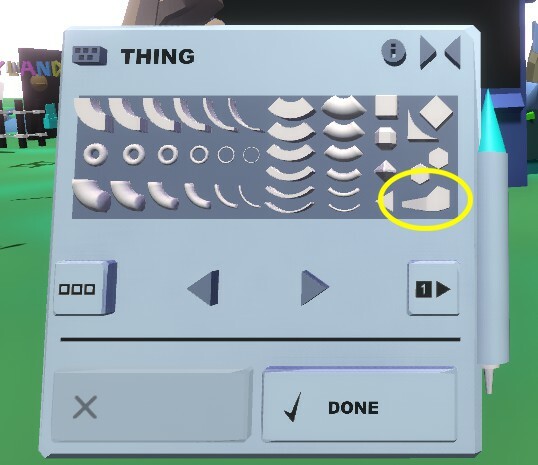 New objects are created by hitting the ring button and "Create Thing". Existing things can be edited again by context-lasering them and picking "Edit" (a new version will be saved upon hitting Done, leaving old placements unaffected). An individual base shape part of a full Thing creation. You can use up to 1000 Thing Parts per creation. A Thing that is attached as child to a Thing Part. There are Included Sub-Things (default) or Placed Sub-Things (from the area). You can include up to 1000 Sub-Things per Thing, and up to 100 placed Sub-Things. States (also called Cells), ranging from 1 to a maximum of 50. Each state can use different positioning, rotation, color, scripts, "call me" names and more. For instance, a cube may be red and small in state 1, and green and big in state 2. Smooth transitioning animations between cells are handled automatically. By default, every object in Anyland can be collected if you come across it in a public area. (You can also search for public objects all across the universe in your backpack's voice/ text search.) In addition, Things which are set to be Clonable in the "..." settings (or where the creator picked Me → "..." → "All my creations are clonable") can be used to edit & inspect, and create new spin-offs. If you ever need help on a specific item of yours, try to make it clonable, then share it in the in-world forums (by dragging it out of your inventory while writing a comment). This way everybody else can check out your code. One of the multiple shapes you can use to make up your objects. See the Thing Structure reference for a full overview. A Thing that's persistently placed in the area (by an editor). Some commands (where noted) require a placement to work, as it guarantees an editor approved their use in the area. Anyland Time (also shown at the backside of the main dialog, as well as on in.anyland.com), is a global time which is the same for everyone, useful for coordinating meetups. It's the same as Universal Time (UTC). → Have Questions, Suggestions & Feedback? Please post in our Steam forum!